The 1st Project Partner’s Meeting happened on 17 August 2015 at Faber Hall in the Ateneo de Manila University. The meeting was attended by mangrove managers from Leyte (Palompon), Palawan, Subic Bay, Zambales (Masinloc), and Pangasinan (Bani). Officials from the Palawan Council for Sustainable Development (PCSD), Subic Bay Metropolitan Authority (SBMA) including NGO partner from Community-Centered Conservation (C3) and NGA partner from Philippine Nuclear Research Institute (PNRI) attended the event. Dr. Ian Navarrete of the Environmental Science Department emceed the activity. Mr. Randy Vinluan of USAID-Philippines presented the USAID-PEER Program as well as why the project received funding. 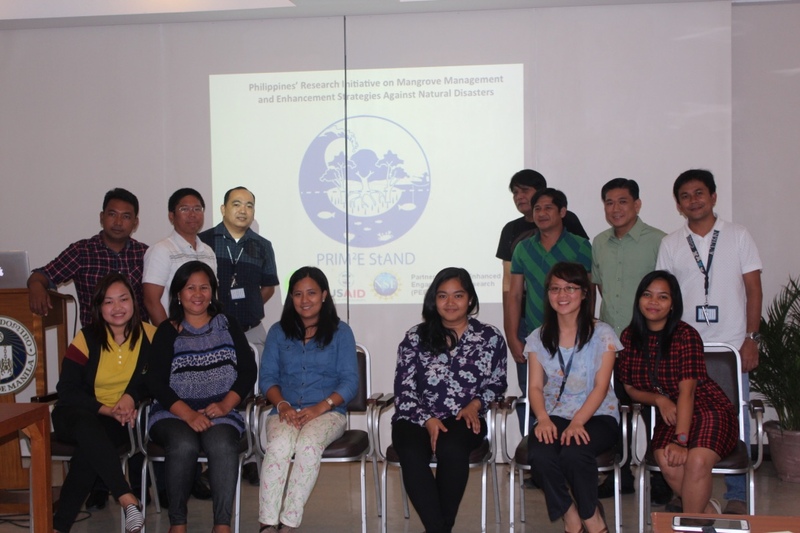 The official name (including the logo) of the project was launched, as: Philippines’ Research Initiative on Mangrove Management and Enhancement Strategies Against Natural Disasters (PRIM2E StAND). Dr. Salmo, Principal Investigator, explained the rationale, objectives and methodology of the project. Ms. Kayla Castro, Ms. Carmela Garcia and Ms. Brigitte Lim presented the preliminary results of the project. Some of the highlights of their presentation are the estimated carbon stocks and sequestration rates as well as the sedimentation rates in the selected project sites. A planning workshop was facilitated by Mr. Rene Turion. Some of the activities proposed and discussed were the addition of sampling sites, the training on mangrove monitoring, and the next partner’s meeting which will be held in Palompon, Leyte in July 2016. It will be co-hosted by the municipal government of Palompon. The project thank all the project partners and supporters. Until our next meeting. Maraming salamat! The synthesis of case studies and minutes of the meeting can be found here.